Work life is tedious and the eight or so hours we spend at the workplace could be made better. Offer your employees a bit of a treat by signing your company up for the corporate rewards program. 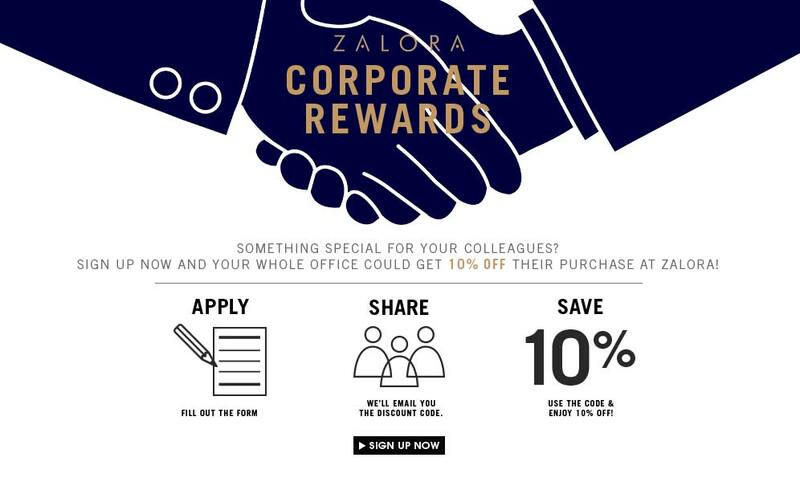 Corporate membership means that each and every employee will receive a ten percent discount when they make a purchase at Zalora PH! Anyone can sign up on behalf of the company or office. You just need to log in at http://www.zalora.com.ph/corporate-rewards-signup and complete the required fields. Zalora will then confirm if the details are correct by getting in touch with the HR or Personnel manager. Zalora will also ask how many employees will be entitled to the 10 discount. The 10 percent corporate discount is just the start of the fun things that your membership brings you. Other tie ups, partnerships or deals are also possible. One thing’s for sure, your employees or co workers will be dressing up in style and sporting more fashionable accessories thanks to the corporate membership you signed on their behalf. Apart from Corporate rewards, Zalora PH also offers a similar campus rewards program. Here students, teachers and other employees of schools, colleges or universities can also avail of a ten percent discount as well as other freebies and offers whenever they shop at the Zalora site. An exciting Invite-a-Friend program is also on offer! You and your friends can earn shopping money just by signing up for membership at www.zalora.com.ph Open yourself up at to a world of discounts, freebies and wonderful discounts just by signing up at Zalora PH. For more information, you may visit the Zalora site today!